If your kitty seems to spend most of the day sleeping like an angel, don't be too alarmed. She's just being a typical feline. Cats love to nap and tend to spend more time asleep than awake. Oh, to possess the enviable existence of a cozy house cat. Cats often sleep for around 16 hours a day, the ASPCA notes -- probably at least double the amount of time the average human sleeps. Some cats sleep for as "little" as 13 hours, while others may go as long as 18 hours. The ample shut-eye in no way implies that cats are idle creatures. It actually means that felines are typically lively and boisterous animals. They simply require a lot of rest and relaxation to make up for their high-energy episodes throughout the course of the day, whether they involve sprinting to the food bowl or vigorously chasing after a beloved stuffed birdie. Cats do indeed sleep like champions, often during the daytime. Cats are night owls, and this behavior is in their genes -- they're related to the predominantly nocturnal African wildcat, after all. If you notice that your cute pet seems antsy and restless as you attempt to get some peaceful, much-needed sleep at night, don't blame her. It's simply in her blood. Squeeze in energetic playtime with your kitty right before you hit the sack. If you tire her out right before you turn in, she may just decide to go to sleep, too. A win-win. Cats typically spend a staggering two-thirds of their entire existences asleep. This abundant sleep also isn't too common within the animal kingdom, either. In comparison with other mammals, cats sleep roughly twice as much. And felines tend to sleep even more as they age, the Cornell University College of Veterinary Medicine states. Though human beings often sleep less the older they get, it's actually usually quite the opposite with cats. If you notice that your cat also seems sleepier than ever, consider her emotional state. 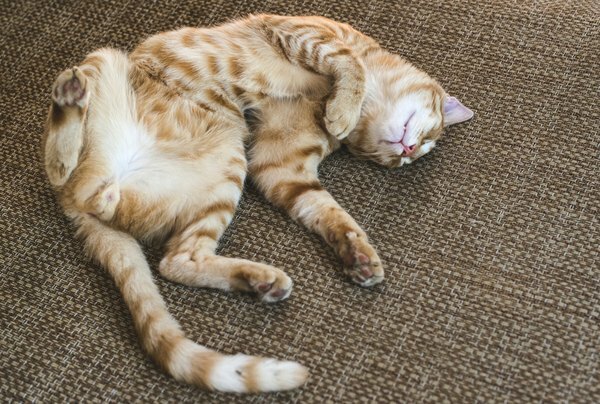 Abnormal sleeping habits often indicate stress or anxiety in felines, whether due to the passing of a household member, a major move or anything else. If you're worried that this may be the case with your pet, do what you can to alleviate her nerves, whether you spend more time with her or talk to the veterinarian about temporary anti-anxiety medications for cats. Why Do Cats Sleep a Lot? What Might Make a Cat's Tail Curl Like a Pug's?